Making my own meatloaf makes me feel like a real grown-up. Like I'm supermom (to my pets), housewife of the year (to my boyfriend)... like whipping up a family dinner is no big thing. I guess I just love how you cannot mess up meatloaf. It always tastes delicious, always tastes like home, and always makes the perfect leftovers for lunches. 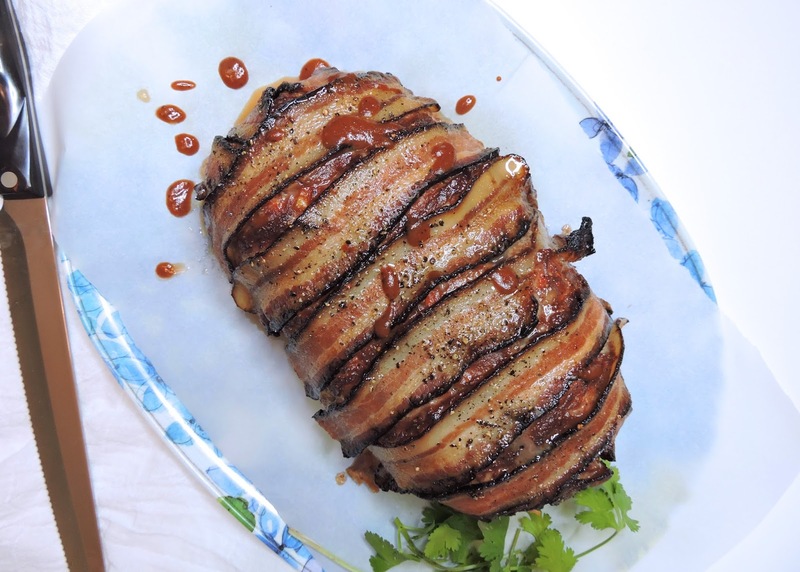 Top it with BBQ sauce & bacon, and it's seriously taken to a whole new level! Just two extra ingredients dress up your meatloaf in a way that will have others thinking you spent double the amount of time on dinner than you actually did. In reality, you're simply mixing up ingredients, forming them into a giant loaf, and topping with BBQ sauce & strips of bacon. It all cooks at once, while you can clean up any dishes and act natural~ like this fabulous dinner was no big deal... And the best part is that it really isn't a big deal-- it just looks & tastes that way! If you want to get real fancy, make a couple of sides. I'd go for something like my Paleo Drop Biscuits and Crispy Oven Green Bean Fries, which are equally tasty & simple to make. 1 tsp each*: Paleo Powder, Spice Cave "Land"
1/2 tsp Spice Cave "Fire"
Line the baking dish with parchment paper, and set aside. In a large mixing bowl, use your fingers or a large fork to mix the ground beef, chopped vegetables, coconut flour, spices, and eggs until well combined. Transfer the mixture to the prepped baking dish, using your hands to form it into a "loaf" shape. Use a spoon, butter knife, or rubber spatula to spread the BBQ sauce over the top and down the sides of the meatloaf. 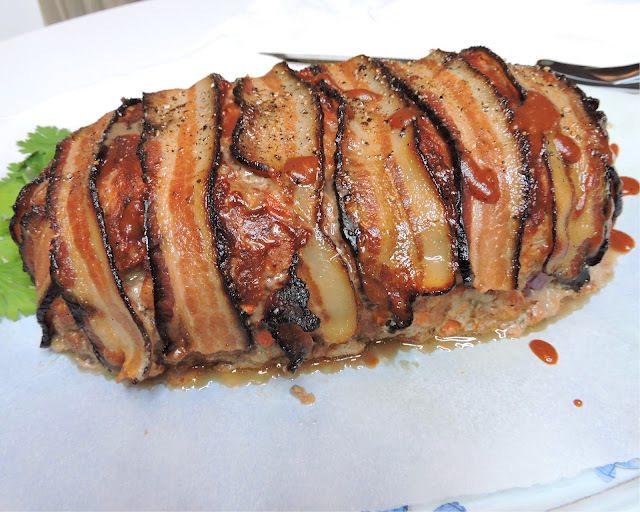 Then, cover the meatloaf with slices of bacon. I cut a couple of the slices in half to make shorter pieces for the ends of the meatloaf~ Gotta cover every square inch for maximum bacon flavor! Top with fresh cracked black pepper, and transfer to the oven. Bake for 45 to 55 minutes, or until juices run clear. Allow the meatloaf to "rest" for about 5 minutes before slicing and serving. 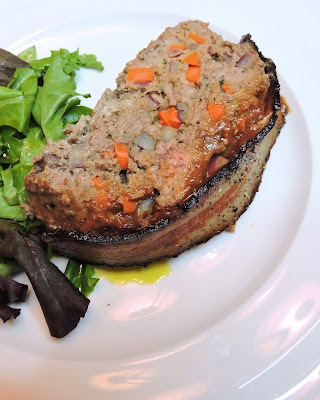 I used the bacon strips as a guideline for slicing the meatloaf~ and it made the perfect serving size! Any Paleo-friendly flour you have on hand will work if you don't have coconut flour or don't prefer it. If you don't have the seasoning blends I mentioned, try the following: any all-purpose blend for "Paleo Powder", garlic powder for "Land", and a spicy blend or cayenne pepper for "Fire". I do highly recommend the Spice Cave spices & the Paleo Powder... so give those a shot if you get the chance! You can make your own BBQ sauce, or find a jarred one that's low in refined sugar. We love the Tessemae's version that is Whole30 compliant, and sweetened with dates.